Pity poor Universal (or NBC Universal now), they just can't catch a break reviving KNIGHT RIDER. There's no doubt that the old adage "The car's the star" always applied here but - it seems - without the Hoff permanently ensconced behind the steering wheel, the punters just ain't interested. CODE OF VENGEANCE was the only spin-off show that (however briefly) went into production alongside the original show. The two-part episode Mouth of the Snake was a back-door pilot for a new series, originally titled All that Glitters, built around the character David Dalton. The original plan was that Dalton (played by Charles Taylor) was going to be a government agent in the James Bond tradition (surprisingly, knowing Larson's fetish for the character, the uber-producer had already moved across to 20th Century Fox and his only ongoing involvement with KR was cashing the royalty cheques) but - when the concept was retooled for COV - he became a drifter. The original 1985 COV tele-flick scored well and the character returned in a second TV movie and two one-hour shows before cancellation. The KR episodes are on DVD but COV never crossed the Atlantic and has now vanished without trace. KNIGHT RIDER 2000 was the futuristic 1991 TV movie which reunited the Hoff with Edward Mulhare in the hopes of spinning-off a new KR weekly series with a new cast and a new car - the Knight 4000. It's not a bad tele-flick and scored highly but the planned series didn't materialise. It aired on British TV and features - as a most welcome bonus feature - on the KR season one DVD set. KNIGHT RIDER 2010 was - despite the title - almost entirely unrelated to either the previous movie or the original weekly series. None of the previous cast reprised their roles and the only connection to the franchise was the idea of a sentiment car being used in the fight against injustice. I watched this futuristic flick - originally shot for Universal's syndicated Action Pack TV movie package in 1994 - again recently and it still made a minimal impression. Even whilst I was watching. It's not available on DVD but has aired on British TV on Channel Five (which is where my copy comes from). 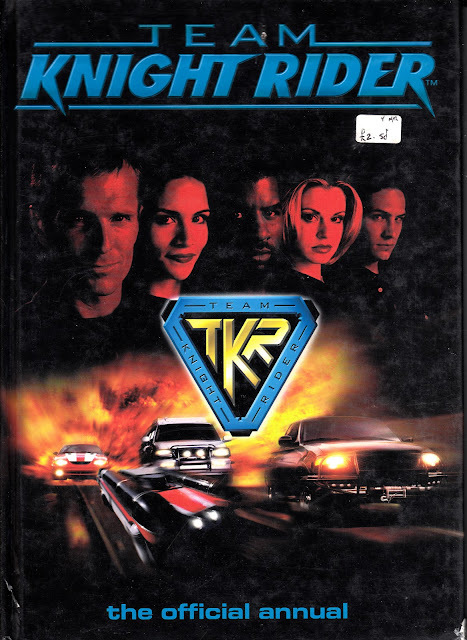 TEAM KNIGHT RIDER was Universal's 1997-98 single-season syndicated show which applied the (flawed) logic that more high-tech hardware (five talking vehicles!) would pull in the punters. This did (loosely) follow the continuity of the original series (but not KR 2000) and Michael Knight is mentioned... but never appears. This show did cross the Atlantic and - briefly - appeared on ITV's Saturday evening schedules... before vanishing without trace after only a couple of episodes. As far as I know, it was never rescheduled in ANY timeslot and - presumably - the rights were allowed to quietly expire. Grandreams (who, I'm surprised to note, were still in business in the late nineties) obviously thought ITV would treat the show better and dutifully issued the annual pictured below in 1998. As far as I know, this was one of the few pieces of merchandise pegged to the show. KNIGHT RIDER - Jump forward to 2008 and its time for another TV movie reboot, this time *briefly* featuring an uncomfortable-looking Hoff (he's been banging-on for years - even on the DVD commentary for the original pilot movie - about a feature film revival and, possibly, saw the chances diminishing before his eyes) in yet another attempt to get a weekly series commission. This time, with the Hoff-factor applied, they got the green light although the new weekly series managed only a single (short) season. It's notably for featuring a homage to - of all things - Captain Jack and TORCHWOOD. Really. It's not a great show but - like the BIONIC WOMEN revival - not really deserving of its tepid reputation.